Here's a very cool spider. It's a pity so many people don't like spiders. They're actually very interesting. And hasn't Jenna done a very nice picture of one? It looks like a kind of tarantula. 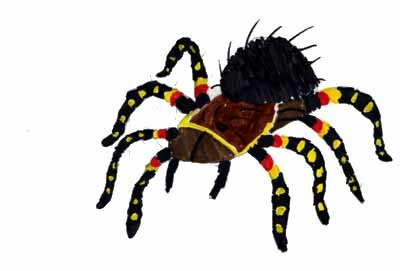 People think because tarantulas are big and hairy they must be dangerous. Actually a bite from a tarantula is no worse than a bee sting. I'd be a lot more scared of a black widow spider! Jenna says, "Well, I hope you have a great time this year at the Amazon!" More children's art will be added shortly!